One of the most venerated equalizers of all time, the all-tube Pultec EQP-1A has been cherished by recording and mastering engineers for its almost magical ability to improve the sound of nearly any signal running through it. Now, after considerable research and development, the A-Designs Audio EM-PEQ has captured the essence of the highly revered Pultec EQP-1A and placed it in the compact and popular 500-Series form*—with no compromise in sonics or build quality. Along with modern performance enhancements, the A-Designs Audio EM-PEQ meticulously maintains the EQ-section design and control layout of the original Pultec EQP-1A, as well as its wonderfully smooth musicality. It also has the same frequency settings and inductors that made the Pultec a must-have for capturing the bottom end. 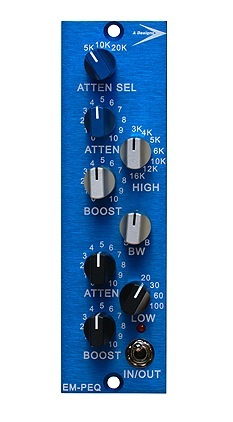 Makeup amplification is achieved through the use of the same discrete Class AB amplifier found in A-Designs Audio’s immensely popular solid-state Pacifica mic preamp—putting a slightly unique and modern twist on the classic design of yesteryear. The EM-PEQ’s controls attenuate high band at 5k, 10k, 20kHz; vary bandwidth AND boost mid to high band at 3k, 4k, 5k, 6k, 10k, 12k, 16kHz; and boost or attenuate the low band at 20Hz, 30Hz, 60Hz, or 100Hz. Boost and attenuation range from 0dB to ±10dB. Additional features of the EM-PEQ include a nickel-core output transformer, gold Grayhill rotary switches, Wima caps, and a true hard-wired bypass. Plus, instead of using common off-the-shelf chokes, A-Designs uses a custom tapped inductor, wound to the original values as the original Pultec. Along with the classic EQ circuitry, layout, and exceptionally musical sound of the classic Pultec, the EM-PEQ offers fully balanced, noise-free performance and modern impedance specs for easy operation and fast studio integration. In the world of pro audio recording, there are two types of equalizers: those that you don’t want to hear in action (“surgical or corrective EQ), and those that you do (“color, or character” EQ). The EM-PEQ is one you most definitely do. Unlike any other 500-Series equalizer, the A-Designs EM-PEQ sits on the extreme end of the “character” bench. It focuses on “correcting” that which cannot be fixed by so-called surgical EQs: the enhancement of tone and musicality. The EM-PEQ is also available as the EM-EQ2, a 2-channel, 2U rackmount version offered at the same price as two EM-PEQs and a 500HR power rack. Whether you prefer to work with the 500-Series form factor or standard rackmount format, both the EM-PEQ and EM-EQ2 are identical in both sound quality and functionality. * The EM-PEQ is an approved API™ VPR Alliance product and may also be used in Brent Averill Enterprises racks, and the 2-bay A-Designs Audio’s 500 HR power supply/rack. The EM-PEQ requires 48V to operate. Please check your power rack for this feature before purchasing an EM-PEQ. • Excels at tracking, mixing and mastering—a truly magical EQ! Contact: blindtree@naver.com for more information. Copyright © 2019 VintageVoltage All rights reserved.